Through voices that crack up, sniffs and endless tissue pulls these real wedding vows from brides to their grooms have made us all mushy – and how! We put together seven share-worthy, giggle provoking, tear jerking wedding vows from brides all around the world. It doesn’t take fancy words or complicated sentences to communicate your love to your fiancé; all you need is a heart full of happiness, 2-3 inside jokes and a whole lot of love to make the perfect tissue-grabbing wedding vows. WEDDINGZ SHOUTOUT –Dear Brides: No better day than your wedding day to get personal and express your love to your groomie in your own words. If your wedding ceremony does not allow time and space for it, consider adopting this ritual from the West as part of your Sangeet, Engagement or a pre wedding function. You will both remember this forever. You have made me feel more loved than I ever thought possible. From today I choose to give you all that I am, and all that I have. Just as I give you my hand to hold today, I give you my heart, my faith, my life. I choose you today. And I would choose you again tomorrow. I would go on choosing you the day after, and every day for the rest of our lives. You are my once-in-a-lifetime. I love you and I too will always carry you in my heart. I love that you would spend your last hundred rupees just to see somebody else happy. I love that you're strong and honourable, yet warm and compassionate, loving and accepting of all people. I promise to stand by you, and to be the president of your fan club. I promise to never let anything come between us, to fight for us, to love you through good times and challenging times, and to always maintain a sense of humour and adventure as we take our next steps together into the unknown and beautiful future. I am truly blessed to be a part of your life, which as of today becomes our life together. I promise to encourage your dreams, because that is what makes you so unique. I promise to celebrate the joy of every day with you. I promise to stand by your side through life's most joyous moments and challenging ones. I promise to be kind, patient and forgiving. I promise to always honour your passion for hockey. I promise to always remember that laughter is life's sweetest creation, and I will never stop laughing with you. But most of all, I promise to be your true companion always. For one lifetime with you could never be enough. I promise to make breakfast on lazy Saturday mornings and dance crazily with you like no one’s watching. I promise to laugh with you and at you - and to always be your biggest fan and your partner in crime. I will love you faithfully through the all the difficult and the easy times. Whatever may come, I will always be there, believing every day that love never dies. Today feels like a dream where I marry my best friend. It's been a long journey for us and I cannot thank God enough for bringing you into my life. You were worth the wait. You are my dream come true. I thank you for loving me just the way I am, for always standing by me. Thank you for never giving up on me and cheering me on in life. Thank you for being patient with me in my weakness and showing me grace when I’ve not deserved it. Thank you for taking the time to listen to me. Above all thank you for being a constant friend. And today I make you my vows Jonathan my love as we stand here before God, our family and friends I cannot promise you things will be perfect but i will promise you this that i will always chose to love you and uphold you. I promise to encourage you and support you in your dreams and the plans God has for you. I promise to stand by you in every season, seasons of joy and seasons of sorrow. I promise you that i will never give up on this relationship. I promise to be your biggest fan and your best friend. I promise to protect your heart. I promise to love you passionately holding nothing back. I promise to love God and keep him first in our relationship. You are my love, my best friend. I cannot thank god enough for the journey that we've been on and the journey we're about to take. You are my person always and forever. I can’t promise that my roti’s will always be round or that I’ll always give you the remote control when you ask for it – but I will promise you this. To love you when we’re having our best days and our worst, to give you all I am and all I have without hesitation. From this day I promise to make you happy, give you all the warmest hugs and to party till we drop every Friday night. I promise to make married life an adventure every day and help you make every grey day full of colour. I promise to love you as much as I love my credit card, maybe sometimes a little more. I promise to not hold your poor fashion sense against you and help you pick clothes that are in trend and stylish. From this day forward, I will make sure your lucky shirt is washed for every game day and will always have plenty of potato chips on hand. I promise to love you endlessly through thick and thin, through the good times and the bad, I will love you for richer or poorer, as long as our credit limit stays high. 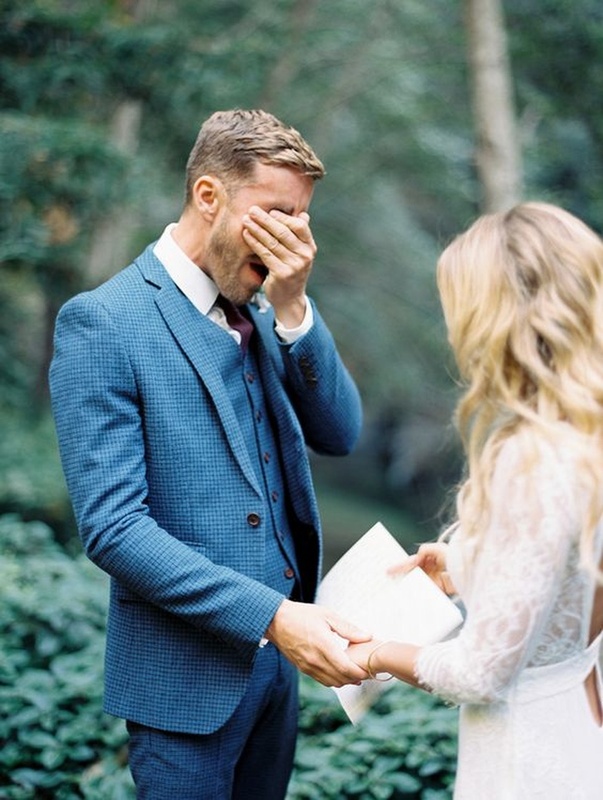 Also see 7 Wedding Vows From Real Grooms that will Make You teary eyed!